Electronics Engineering department is one of the most dynamic and enthusiastic department of the institute. The department was established in the year 2000 which offers B. Tech. degree in Electronics and Communication of four years duration. The intake capacity of the department is 60 students as per the AICTE approval. Electronics engineers are changing the world to a comfortable global home. The information and technology revolution has been built on the advances of Electronics. In an age when electronics play a major role in daily life and the promise of nanotechnology is coming to fruition, it truly is a great time to be a part of E&C engineering. Excellent Teaching learning process through modern teaching aids like LCD Projectors, OHPs & Laptop. Industrial Visit & Continuing education programme (Workshops, Seminars, STTP, Paper Presentations). Strong industry interface with leading companies..
Department of Science & Technology (DST) sponsored the student’s projects. To produce creative engineers with social responsibility who can address the global challenges in the field of Electronics and Communication Engineering. This field has an opportunity in two types of companies, Telecom Industries and Software Industries. An electronics and communication engineer can work in aviation and avionics, consumer electronics, electricity plant, manufacturing, transportation, communication & telecommunication, computer application, radio & television, diagnostic equipment manufacturing and offshore companies. There is an opportunity to get a central government job, state government job and in public & private sectors. 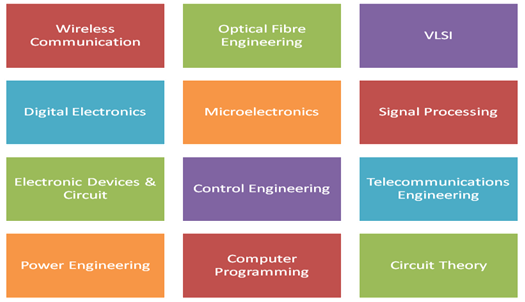 Salary packages offered to electronics engineers vary upon various factors such as working skills, qualifications, working area, recruiters and many other terms. Big MNC's like Texas Instruments offer salaries in the range of Rs. 60,000 to Rs. 1,20,000 per month. Indian companies offer salaries in the range of of Rs. 30,000 to Rs. 60,000 per month. Based on talent and experience, salaries can vary.